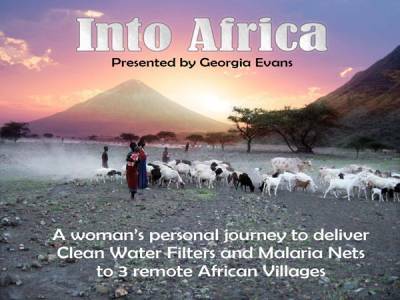 Georgia Evans is excited to present "INTO AFRICA" a slide show and talk from her recent trip to Tanzania, Africa. She will be sharing the images from her visits to 3 remote African villages where she gifted each village with a community size clean water filter as well as malaria bed nets for each villager to sleep under and keep mosquitoes out. It was a real adventure and she has the photos to let you experience it too! Presentation will also include images from the magnificent wildlife of Tanzania. Great family time. Fun, educational, eye opening and you will never look at your home here in America quite the same again. Doors open at 11 am for our setup...feel free to come early to mingle and get your seat. Doors open at 6 pm for our setup...feel free to come early to mingle and get your seat. FREE Donations gratefully accepted to help support this lifesaving project. PLEASE REGISTER with above links or can RSVP by message or email.